A bibliographical genealogy of cybernetics in the United States, France, Soviet Union, and Germany in the 1940s and 1950s, followed by a selected bibliography on its impact across the sciences. Norbert Wiener, Cybernetics: or Control and Communication in the Animal and the Machine, 1948. Download (Second edition, 1965). Norbert Wiener, "The Machine Age", . Download (v3). Norbert Wiener, The Human Use of Human Beings: Cybernetics and Society, 1950. Download (1989 edition). Norbert Wiener, The Extrapolation, Interpolation, and Smoothing of Stationary Time Series, NDRC Report, MIT, February 1942. Classified (ordered by Warren Weaver, then the head of Section D-2), printed in 300 copies. Nicknamed "Yellow Peril". Published in 1949 (see below). Shannon 1948 mentions it as containing "the first clear-cut formulation of communication theory as a statistical problem, the study of operations on time series. This work, although chiefly concerned with the linear prediction and filtering problem, is an important collateral reference in connection with the present paper" (p 626-7). , Commentary. Norbert Wiener, The Extrapolation, Interpolation, and Smoothing of Stationary Time Series with Engineering Applications, Cambridge, MA: Technology Press, 1949; New York: John Wiley & Sons, 1949; London: Chapman & Hill, 1949; 2nd ed., MIT Press, 1966. 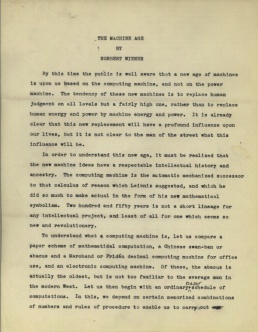 Earlier printed as a classified NDRC "yellow peril" Report, MIT, 1942. Uses Gauss's method of shaping the characteristic of a detector to allow for the maximal recognition of signals in the presence of noise; later known as the "Wiener filter." Reviews: Tukey (1952). Norbert Wiener, "The Machine Age", . Unpublished. Written for The New York Times. 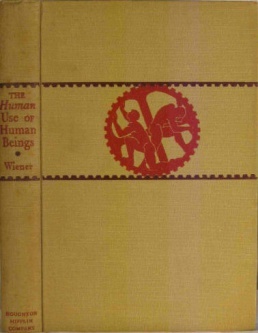 Norbert Wiener, The Human Use of Human Beings: Cybernetics and Society, Boston, MA: Houghton Mifflin, 1950; 2nd ed., 1954; London: Eyre and Spottiswode, 1954; New York: Avon Books, 1967; New York: Da Capo Press, 1988; London: Free Association Books, 1989; new ed., 1990. Cybernetics: Transactions of the Sixth Conference, New York: Josiah Macy, Jr. Foundation, 1949. Cybernetics: Transactions of the Seventh Conference, eds. Heinz von Foerster, Margaret Mead, and Hans Lukas Teuber, New York: Josiah Macy, Jr. Foundation, 1950. Cybernetics: Transactions of the Eighth Conference, eds. Heinz von Foerster, Margaret Mead, and Hans Lukas Teuber, New York: Josiah Macy, Jr. Foundation, 1952. Cybernetics: Transactions of the Ninth Conference, eds. Heinz von Foerster, Margaret Mead, and Hans Lukas Teuber, New York: Josiah Macy, Jr. Foundation, 1953. Cybernetics: Transactions of the Tenth Conference, eds. Heinz von Foerster, Margaret Mead, and Hans Lukas Teuber, New York: Josiah Macy, Jr. Foundation, 1955. 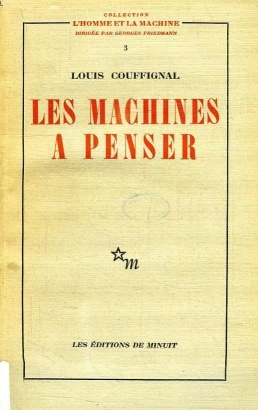 Louis Couffignal, Les machines à penser, 1952. 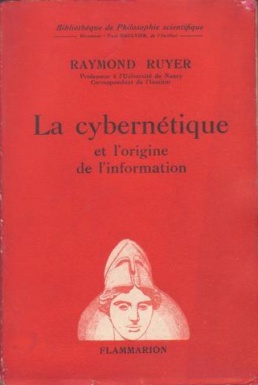 Raymond Ruyer, La cybernétique et l'origine de l'information, 1954. Download. Marcel-Paul Schützenberg, "Contributions aux applications statistiques de la théorie de l’information", Publications de l'Institut de Statistique de l'Université de Paris 3:1-2 (1954), pp 3-117; repr. in Œuvres complètes, Tome 3: 1953-1955, Paris: Institut Gaspard-Monge, Université Paris-Est, 2009, pp 56-161. (French). Ph.D. Dissertation defended at the Faculté des Sciences in Paris in June 1953. Liapunov, Kitov, Sobolev, "Osnovnye cherty kibernetiki", 1955. View online. A.N. 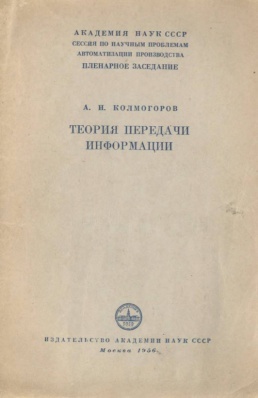 Kolmogorov, Teoriya peredachi informatsii, 1956. Download. Igor’ A. Poletaev, Signal: O nekotorykh poniatiiakh kibernetiki, Moscow: Sovetskoe radio, 1958. 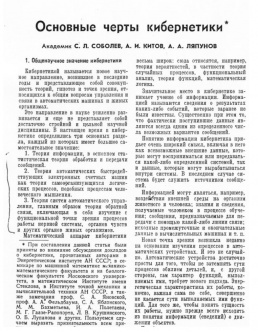 (Russian). The first Soviet book on cybernetics. Werner Meyer-Eppler, Grundlagen und Anwendungen der Informationstheorie, Berlin: Springer, 1959, xviii+446 pp; 2nd ed., eds. Georg Heike and K. Löhn, Berlin: Springer, 1969. (German). Reviews: Tamm (1960), Billingsley (1961, EN), Adam (1965). 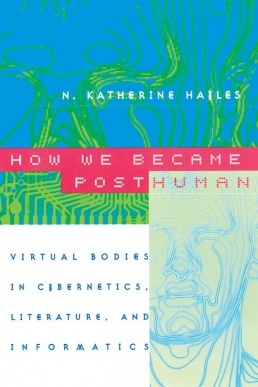 N. Katherine Hayles, How We Became Posthuman: Virtual Bodies in Cybernetics, Literature, and Informatics, 1999, Log, PDF. James R. Beniger, The Control Revolution: Technological and Economic Origins of the Information Society, Cambridge University Press, 1986. Book-inspired website. Geof Bowker, "How to be Universal: Some Cybernetic Strategies, 1943-1970", Social Studies of Science 23:1 (1993), pp 107-127. Peter Galison, "The Ontology of the Enemy: Norbert Wiener and the Cybernetic Vision", Critical Inquiry 21:1 (Autumn 1994), pp 228-266. 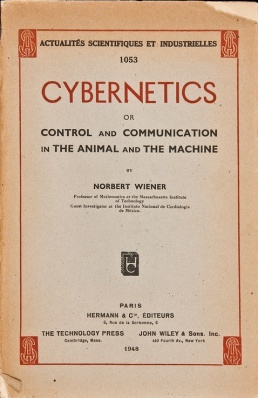 Demonstrates the significance of the war effort of devising a servomechanical shooting device, in which Wiener participated, as a defining moment in the elaboration of the cybernetic model. The Mechanization of the Mind: On the Origins of Cognitive Science, trans. M. B. Debevoise, Princeton University Press, 2000, 240 pp; new ed., MIT Press, 2009, 210 pp. A survey of the Macy conferences. Review, . N. Katherine Hayles, How We Became Posthuman: Virtual Bodies in Cybernetics, Literature, and Informatics, University of Chicago Press, 1999, 350 pp. Slava Gerovitch, "'Russian Scandals': Soviet Readings of American Cybernetics in the Early Years of the Cold War", The Russian Review 60 (October 2001), pp 545-568. Slava Gerovitch, From Newspeak to Cyberspeak: A History of Soviet Cybernetics, MIT Press, 2004, 383 pp. Bernard Dionysius Geoghegan, "The Historiographic Conception of Information: A Critical Survey", The IEEE Annals on the History of Computing 30:1 (2008), pp 66-81. Andrew Pickering, The Cybernetic Brain: Sketches of Another Future, Chicago University Press, 2010, 526 pp. Renders a history of British cybernetics with only brief excursions into information theory. Steve Joshua Heims, The Cybernetics Group, 1991. Log, PDF. Charles R. Dechert (ed. ), The Social Impact of Cybernetics, Notre Dame: University of Notre Dame Press, 1966, vi+206 pp. Based on symposium held in Washington, D.C., in Nov 1964. Essays by John Diebold, Robert Theobald, Ulric Neisser, Marshall McLuhan, Hyman G. Rickover, Maxim W. Mikulak, and John J. Ford. Steve Joshua Heims, The Cybernetics Group, MIT Press, 1991, xii+334 pp; paperback ed. 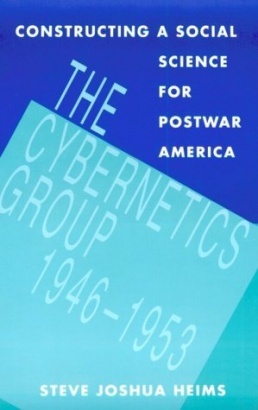 as Constructing a Social Science for Postwar America: The Cybernetics Group (1946–1953), MIT Press, 1993. A survey of the Macy conferences and dissemination of information theory outside the natural sciences. Review: Hayles (HHS), Jones (New Scientist), Martínez-Vela. Céline Lafontaine, "The Cybernetic Matrix of 'French Theory'", Theory, Culture & Society 24:5 (2007), pp 27-46. On the influence of cybernetics on the development of French structuralism, post-structuralism and postmodern philosophy after WWII. Jürgen Van de Walle, "Roman Jakobson, Cybernetics and Information Theory: A Critical Assessment", Folia Linguistica Historica 29 (December 2008), pp 87-123. Bernard Dionysus Geoghegan, "From Information Theory to French Theory: Jakobson, Levi-Strauss, and the Cybernetic Apparatus", Critical Inquiry 38 (Autumn 2011), pp 96-126. Bernard Dionysus Geoghegan, The Cybernetic Apparatus: Media, Liberalism, and the Reform of the Human Sciences, Northwestern University and Bauhaus-Universität Weimar, 2012, 262 pp. Ph.D. Dissertation. Donna Haraway, "Signs of Dominance: From a Physiology to a Cybernetics of Primate Society, C.R. Carpenter, 1930-1970", in Studies in History of Biology, Vol. 6, eds. William Coleman and Camille Limoges, Johns Hopkins University Press, 1982, pp 129-219. Philip Mirowski, "Cyborg Agonistes: Economics Meets Operations Research in Mid-Century", Social Studies of Science 29:5 (1999), pp. 685-718. Cybernetics in economics. Lily E. Kay, "From Logical Neurons to Poetic Embodiments of Mind: Warren S. McCulloch’s Project in Neuroscience", Science in Context 14:15 (2001), pp 591-614. Cybernetics in neuroscience. Jennifer S. Light, From Warfare to Welfare: Defense Intellectuals and Urban Problems in Cold War, Johns Hopkins University Press, 2003. Cybernetics in urban planning. Jacques Lafitte, Réflexions sur la science des machines [Reflections on the Science of Machines], 1911-32. Marian Smoluchowski, "Experimentell nachweisbare, der Ublichen Thermodynamik widersprechende Molekularphenomene", Phys. Zeitshur. 13, 1912. Connecting the problem of Maxwell's Demon with that of Brownian motion, Smoluchowski wrote that in order to violate the second principle of thermodynamics, the Demon had to be "taught" [unterrichtet] regarding the speed of molecules. Wiener mentions him in passing in his Cybernetics (1948) . Ştefan Odobleja, Psychologie consonantiste, 2 vols., Paris: Maloine, 1938-39. Hermann Schmidt, general regulatory theory [Allgemeine Regelungskunde], 1941-54. History of Cybernetics Bibliography compiled by Peter Sachs Collopy, 2012-13. Fields and theories: Classics, Art history, History of architecture, Anthropology, Semiotics, Philosophy of technology, Marxist aesthetics, Design research, Humanities computing, Structuralism, Poststructuralism, Mediology, Media archaeology, Cyberfeminism, Cultural techniques, Neuroaesthetics, Posthumanities, Sensory ethnography, Media ecology, Digital humanities, Software studies, Modern periodical studies, Accelerationism. Concepts: Faktura, Ostranenie, Biomechanics, Commons, Postmedia, Evil media. Related theories: Systems theory, Information theory, Cybernetics. This page was last modified on 11 April 2019, at 10:33. This page has been accessed 23,362 times.